I'm having an unusually free day today. Aside from taking my mum to oncology and doing some light programming catchup work for university things have been smooth sailing. 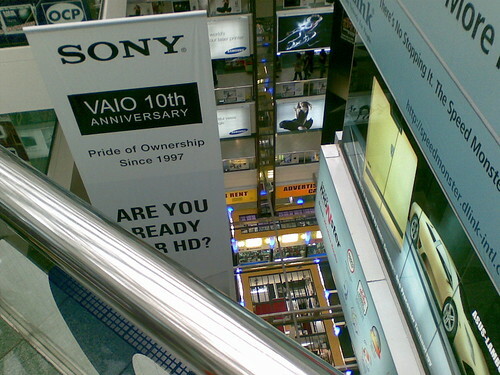 So I thought I'd spend the morning at Sim Lim Square, one of the two heavyweights in the Singapore dedicated computer shopping centre scene. My mission was to buy a replacement processor and motherboard for my dad's desktop which was turned into a brick on the move back from Kuala Lumpur. 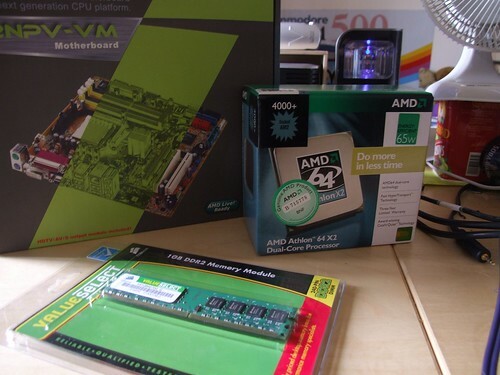 I ended up getting the dual-core energy efficent 65W Athlon 64 X2 4000+ CPU and an ASUS M2NPV-VM motherboard bundled for SG$240.00 and some stock PC6400 1GB RAM for SG$64.00. The prices blew me away mostly because I could remember just a few years ago when the X2s were so elite and high end they were in the thousands of dollars. It's amazing how yesterday's high end chips become today's value ones so fast. By no means is the motherboard state of the art, but my dad has two very large capacity PATA hard disks and two expensive optical drives so I had to get a board that hadn't jettisoned their legacy internal connectors for SATA. They're becoming more difficult to find. With all these awesome parts for such peanuts, it sure makes my NetBSD Athlon XP 2800+ look crappy now!